A half-day at Nierstein saw me attempting to correct the markings on tanks made by some of my predecessors. Somehow the measurements were incorrect so I have to try and calculate the volumes as best I can. It’s taking a little more mathematics than you may think. It also takes substantially more elbow grease and finger-damage trying to get the old markings off. Before this we finished pressing the rest of the silvaner picked yesterday, and also Johannes put some of it with skins into one of his favoured pressure tanks for fermentation. 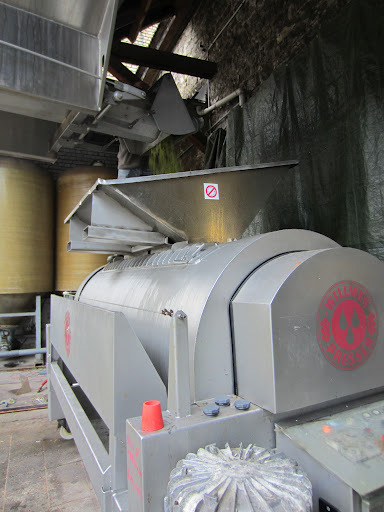 After a night macerating on skins the silvaner is pressed for racking and then fermentation. Johannes took some of the pressed juice from the previous day and left it to settle in a couple of glass balloons. 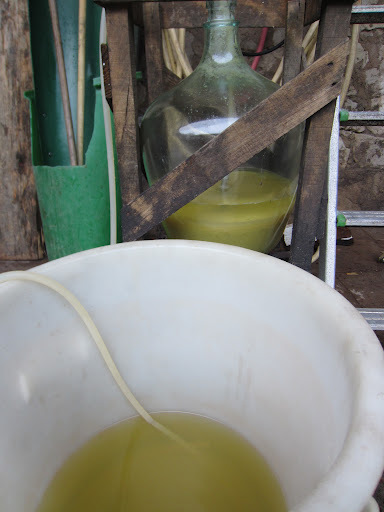 This is the juice being racked, before it will go back into a balloon for fermentation. It had a certain amount of skin contact, and he is trialing this method to extract more character from a generally basic variety.